Some Nice Eye Candy Coming in to See! May need a small telescope to see this one. It appears it is too faint for even binoculars. Things can change with comets, so, keep turned in. The videos below, one shown and the other linked, are quite nice too! Discovered in Dec. 2018 by Japanese amateur astronomer Masayuki Iwamoto, this comet is a visitor from beyond the Kuiper Belt. It comes from the realm of Extreme Trans-Neptunian Objects (ETNOs) more than 5 times as far from the sun as Pluto. This means it could be a relative of other ETNOS such as Sedna, 2012 VP113 ("Biden"), and 2015 TG387 ("Goblin"). Comet Iwamoto doesn't visit us very often. 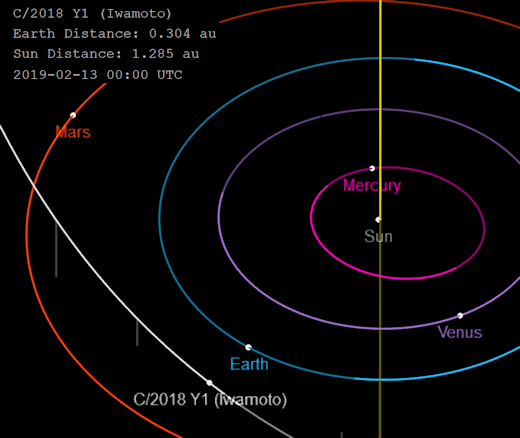 Following a highly elliptical 1371-year orbit, its last passage through the inner solar system was around 648 AD (unrecorded), and its next won't happen until 3390 AD. Therefore, if you want to see the comet, now is the time to look. I get up for work very early, before dawn. I have been watching Spica & thought I saw something new near it's vicinity. Now I know. Thanks for the info. Edited by Vox to remove extraneous quoting.